Watch this video of my village and learn about our literacy project. It's great. Made me homesick a little. PS, watch the video: it's a great update on what I've been doing. From my friend Tom: "If you have received and read the book, please consider writing a brief review of it on any of the online book sites. Amazon is an obvious choice, but Barnes and Noble or Powell's work, too. To write a review click here." The true story of a Malawian teenager who leveraged need and library research into a windmill constructed from found materials. Forced by drought and famine to drop out of school, William dreams of “building things and taking them apart.” Inspired by science books in an American-built library near his village, his dreams turn to creating “electric wind.” Despite the doubts of others he begins—assembling discarded bicycle parts and other junk into a rickety tower, triumphantly powering an electric light and going on to dream of windmill-driven wells to water the land. Kamkwamba tells this version (another, for adult readers, was published with the same title in 2009) of his tale of inspiration meeting perspiration in terse, stately third person: “He closed his eyes and saw a windmill outside his home, pulling electricity from the breeze and bringing light to the dark valley.” Zunon illustrates it handsomely, with contrasting cut-paper-collage details arranged on brown figures, and broad, sere landscapes painted in visibly textured oils. The article was posted earlier on TED's Blog but it's great that it got republished. Exclusive TED Interview with Elizabeth Zunon, illustrator of William Kamkwamba's The Boy Who Harnessed the Wind Young Reader's Edition on her inspirations for her art in the book. Yesterday, TED Fellow William Kamkwamba debuted an illustrated children’s version of his memoir The Boy Who Harnessed the Wind, co-written with Bryan Mealer and illustrated by Elizabeth Zunon. Since its publication in 2009,The Boy Who Harnessed the Wind has been printed in 17 editions. For this Young Readers edition, for ages 6 and up, Kamkwamba’s story is accompanied by Zunon’s uniquely subtle mix of oil and collage. In conjunction with the launch of the book’s children’s edition, Kamkwamba’s NGO, Moving Windmills Project, is collaborating with the Pearson Foundation on an initiative to send up to 10,000 children’s books to Wimbe lending library, near Kamkwamba’s village in Malawi — the place where his story began. Each time the book is read online, the library receives one new book. So far there have been over 7,000 readings completed online. Learn more. 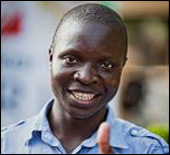 Kamkwamba is now a sophomore at Dartmouth majoring in Environmental Sciences. We caught up with illustrator and former Côte d’Ivoire denizen Elizabeth Zunon to ask her about this beautiful new edition. What about this story touched you? I was touched by William’s problem-solving mentality during a crisis. He endured the drought and had to drop out of school, but still figured out a way to piece together a solution with determination and only the materials that he had. How did you decide the style of the illustrations? I love combining oil painted portraits and collage elements, so I thought that exploring this style would fit perfectly for this book. I am always collecting pieces of colored and textured paper and fabric, and taking photographs. I thought that literally “building” the illustrations with my own found items would reflect Williams searching and building process as well. How do you think your style and William’s story work together to create a new narrative? I think that they both demonstrate the process of collecting, altering and piecing together disparate parts. Trusting in oneself and in one’s idea, even before it has been completed or is actually successful, is the key to satisfaction. Having the artwork demonstrate the same notions that the story does only enforces the narrative. What do you hope young readers will learn from this story? I hope that they’ll learn that you can build your dreams with the pieces that are already around you — that every positive and negative experience you live through is a puzzle piece for the legacy you will leave to others. Hope, courage and endless possibilities live everywhere! As part of the book launch my NGO Moving Windmills Project and I are collaborating with the Pearson Foundation on a literacy program to send up to 10,000 children's books to the library in Malawi where my journey began, as well as to more remote rural primary schools. Parents, teachers and children in the US read high quality books online at this site, and for every book completed, Wimbe community lending library, just a half-kilometer walk from my parents' home, gets one new high-quality book, up to 10,000. The campaign has been running for about two weeks, and already children have read 6,907 books. Despite being a stone's through from my 1500-pupil elementary school, the library currently has NO picture books (except a few copies of my book). Moving Windmills and I are excited to change that. I am happy to celebrate the publication of my new children's book written with Bryan Mealer and illustrated by Elizabeth Zunon. 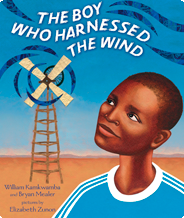 The Boy Who Harnessed the Wind: Young Reader's Edition is a version of our adult book for children 6 and up. Elizabeth's artwork is so beautiful, combining oil paintings and cut paper. I hope that you might consider getting one for the young people in your life.